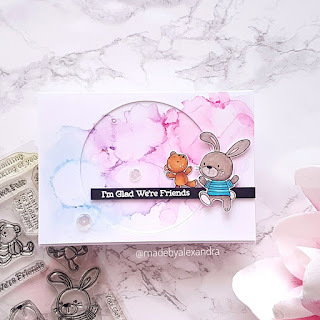 To start the card I die cut a piece a water color cardstock using Dotted Patterns : Scallop Frames creative dies and the stamped and embossed using white embossing powder and Versamark ink. Today starts a new challenge on Create a smile blog and the theme is Favourite Create a smile stamp set . 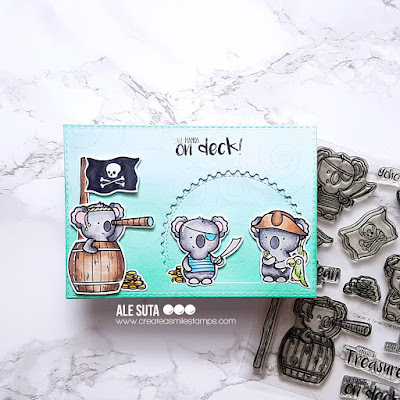 And here is one of mine : All hands on deck , this is I think my most used and loved stamp set <3 my kids really love this adorable pirates so every time I got a chance I use this set . Then I took the largest rectangle die from Cool cuts Double stitched rectangles and die cut my panel , and the took the Cool cuts Postage edge circles and partial die cut the second largest circle. 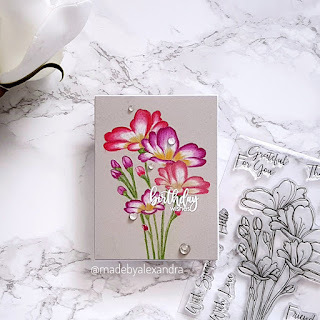 After inking the background using Distress ink I stamped the Sophisticate shells cling stamp using Versa Mark and then adding clear embossing powder . Last I adhered my critters using foam tape and stamped the sentiment from the same stamp set. Thank you for stopping by , have a great day. For this first card I also have a video where I share step by step how I created the card ,and for the second card I just wanted to try my hands on creating my own scene using alcohol markers . 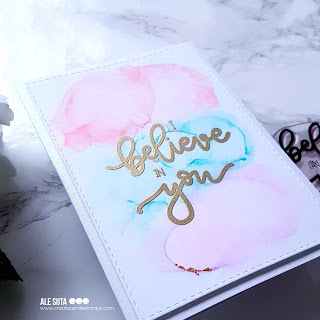 Today I am going to share with you an easy way to create an alcohol ink background using alcohol markers. Then I took an alcohol ink blending solution and added a few drops to the paper and with a straw I moved around the color. You can also check the video that I have created where you can see step by step the process of how my background turned out. 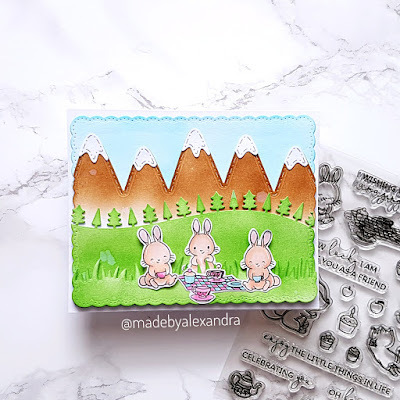 To finish my card I was inspired by the current sketch challenge from MFT, and coloured the images from Snuggle Bunnies stamp set and adhered them using foam tape. Also the sentiments is from the same set , I stamp it on black cardstock using Versa Mark and embossed it using white embossing powder. Finished the card using some Pretty Pink Posh sequins. I started by die cutting the panel using Double Stitched rectangles dies from Create a Smile and the slowly adding color using my distress inks. Stamped the leaves from Clustered leaves stamp from Create a smile and adhered them using foam tape. ♥ ♥Just a quick disclaimer ♥♥ Being in on different design teams some products are sent to me , but the opinions are mine and I share only products that I love. Next I started coloring the flowers using Polychromos pencils and building gradually the color. 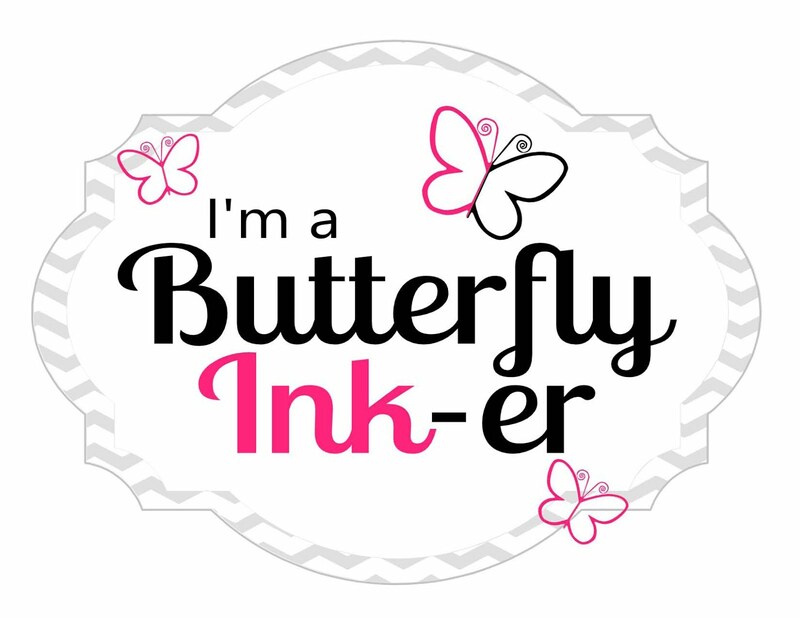 Once the images were colored I stamped the sentiment using Versa Mark ink and white embossing powder . 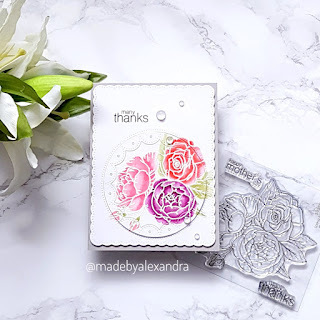 The sentiment is from Studio Katia - Blooming bunch stamp set . To finish the card I added some clear drops also from Studio Katia and adhered them down using Glossy Accents . 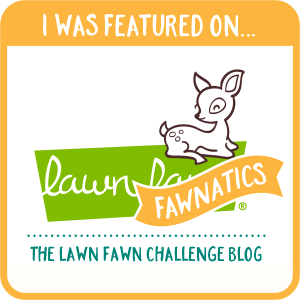 Thank you for stopping by ! Have a great day! Next stamp set from this release is called Bujo Basics and this set can be used for cards but also for bullet journaling . Also made a video in which I am showing you the stamp sets and stencils if you want to check , and I will update the blog post with links to the products once they will be available on Create a smile store!